This is the face that has haunted my dreams since Wednesday's preview night at the 2012 San Diego Comic-Con. It is a face that has weathered eons, wandering the cosmos; sating it's endless hunger. Galactus, devourer of worlds, is famished. 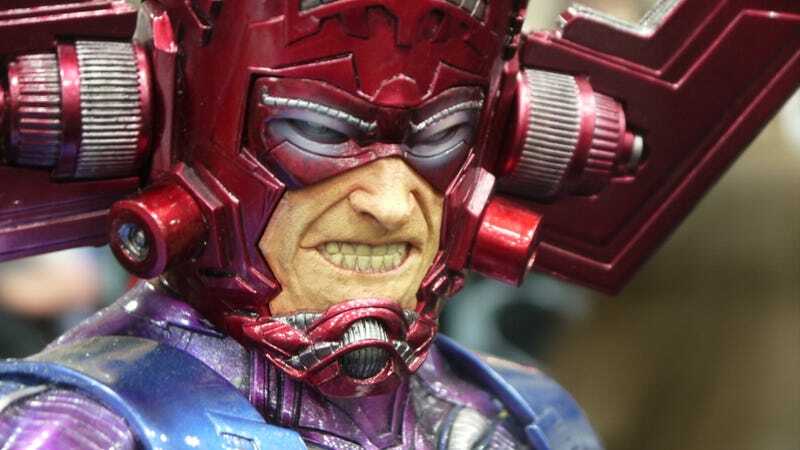 Standing a relatively massive 33 inches tall and weighing in at 25 pounds, Sideshow Collectibles' Galactus maquette (French for tiny mac) is a stunning tribute the Marvel's most terrible and enigmatic celestial being. Sculptor Pablo Viggiano has crafted something truly amazing in that face, an otherworldly visage with just enough humanity to make his habitual planetary consumption that much more terrifying. One expects a hideous space alien with tentacles to destroy the earth. One never expects a giant man in a shiny purple suit. But they should expect him. He does send heralds along beforehand. Galactus will ship in 2013 and is now available for preorder at Sideshow's website. The damage? $799.99, a small price to pay for a being that routinely craps the remains of endless worlds.